Last year, our Think Before You Pink® campaign called out the practice of using oil wastewater to irrigate crops. This water, which is a byproduct of the oil extraction process, contains hundreds of added and naturally occurring chemicals that are harmful to human health, potentially putting the health of farmworkers and consumers at risk. Now we’re digging deeper. We had a win last year when our target, Bee Sweet Citrus, stopped pinkwashing their products. Yet major agricultural companies continue to use oil wastewater to grow our food. 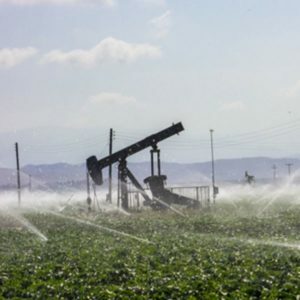 Join our free webinar on Thursday, August 24th at 10 AM PT / 1 PM ET to refresh and deepen your knowledge about the health risks associated with oil wastewater and learn what you can do to protect our health. Register today! Our featured presenter is Dr. Sandra Steingraber, acclaimed ecologist, anti-fracking activist, and author who explores the links between human rights and the environment with a focus on chemical contamination. Sandra is a leader in the anti-fracking movement and will be joined by Breast Cancer Action’s Executive Director, Karuna Jaggar who will speak about the breast cancer-specific risks of oil wastewater. There will be plenty of time for Q&A, so bring your questions for this one-of-a-kind webinar! Register for Thursday, August 24th at 10 AM PT / 1 PM ET!